Get your start in robotics and making things move! The MG90S is an upgrade of the SG90 with even more torque and speed than ever. It also has metal gears which means when the motor is in a jam, the gears aren’t likely to strip. And as a digital servo using a high-speed pulse train, a more detailed configuration is allowed. 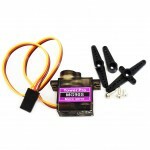 You can expect this micro servo to rotate up to 90 degrees. You can expect it to operate the same as standard versions, but this micro servo is much smaller and can fit into tighter spaces. 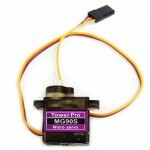 Even though it has metal gears, this tiny little servo weighs only 13.4g, so a good choice for smaller projects.